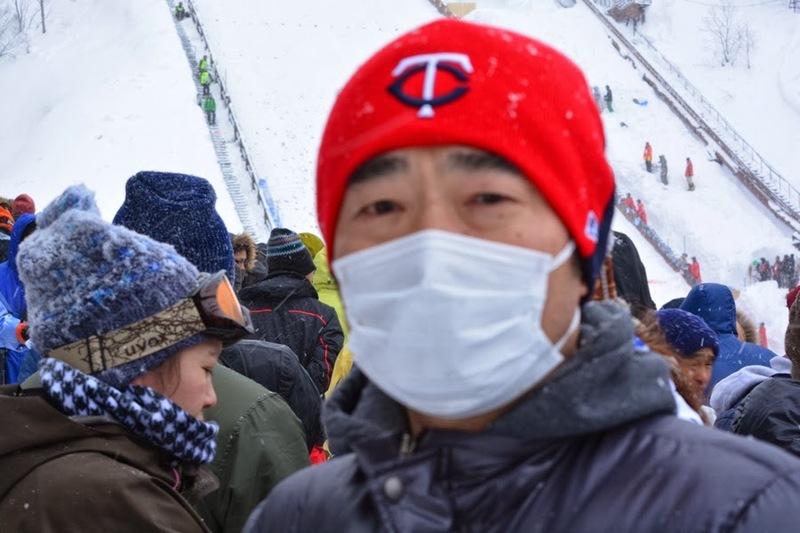 On 19th January, hubby and I went to see Ski Jumping World Cup Ladies in Zao. 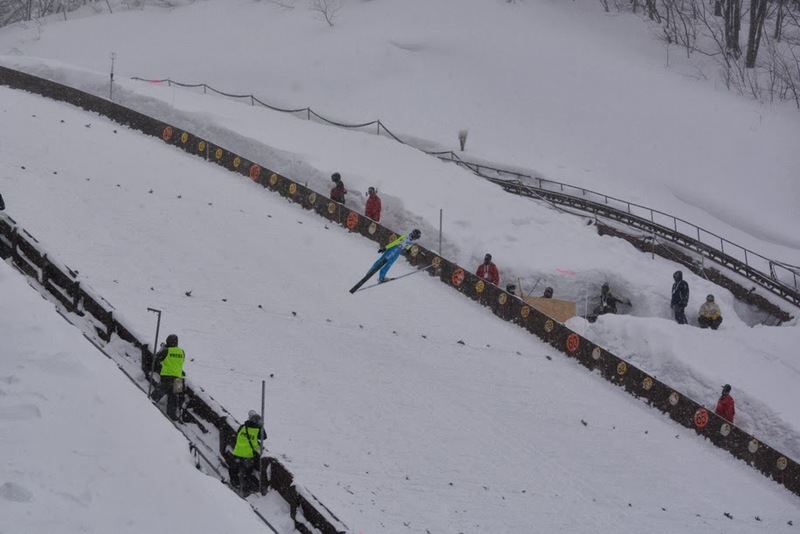 The ski jumping facility is located on Mount Zao in Yamagata City of Yamagata prefecture. 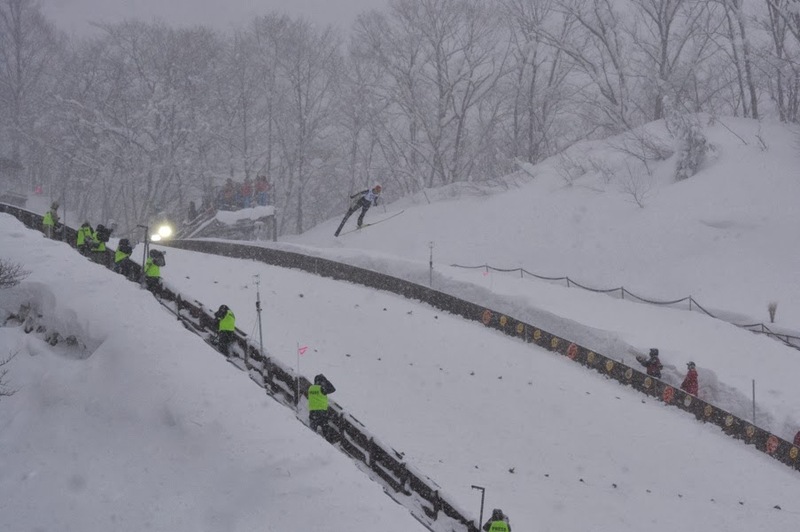 Mount Zao is a complex volcano on the border between Yamagata and Miyagi prefectures, and is famous for many skiing and snowboarding resorts. 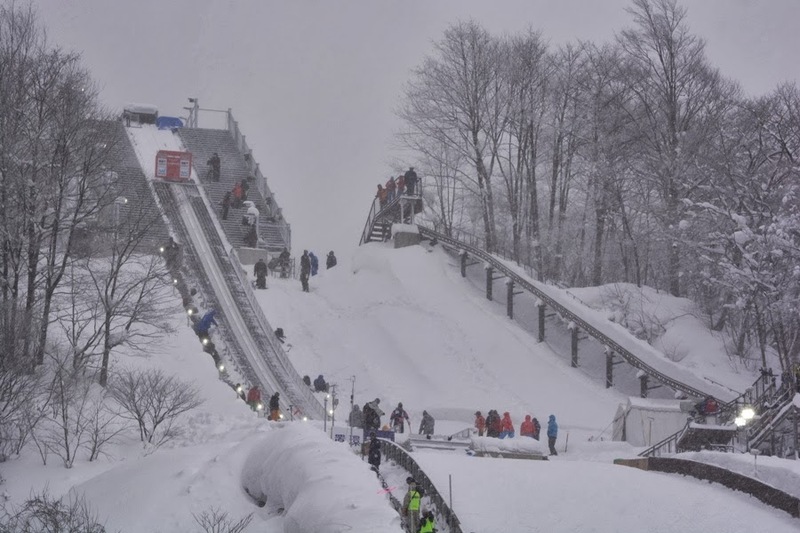 One striking feature of Zao’s ski resorts is the snow monsters called Juhyo that appear in mid-winter. 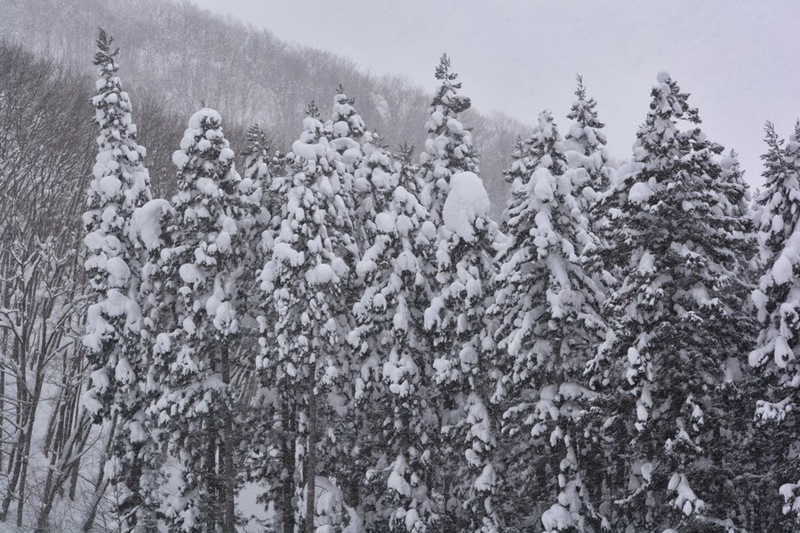 The snow monsters are actually fir trees that have been coated with extremely wet snow and ice carried by a cold Siberian jet stream that also freezes them almost solid in some of the most peculiar and grotesque shapes. The effect of a forest full of such trees gives visitors a ghostly impression. Visitors can enjoy the beauty of nature in the Zao Mountain Range during the summer season also. 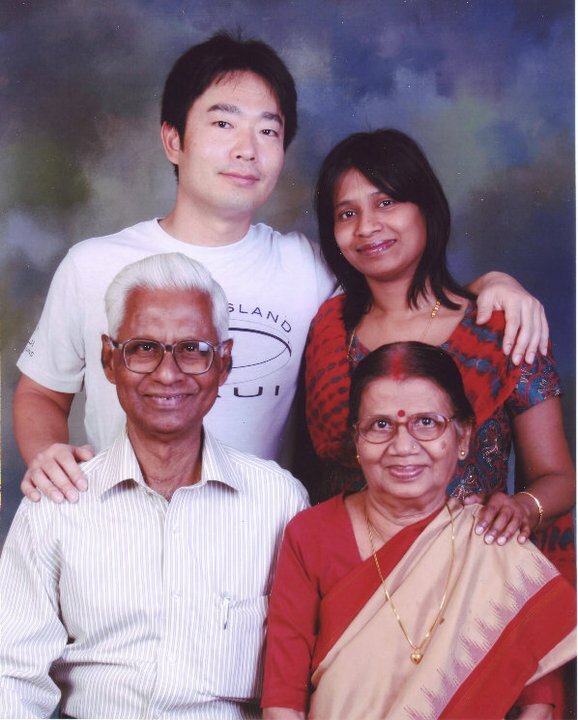 Hubby and I had visited the mountain range in July 2011 and had seen the famous and mysterious Okama Crater Lake, about which I have written a post earlier (click here). 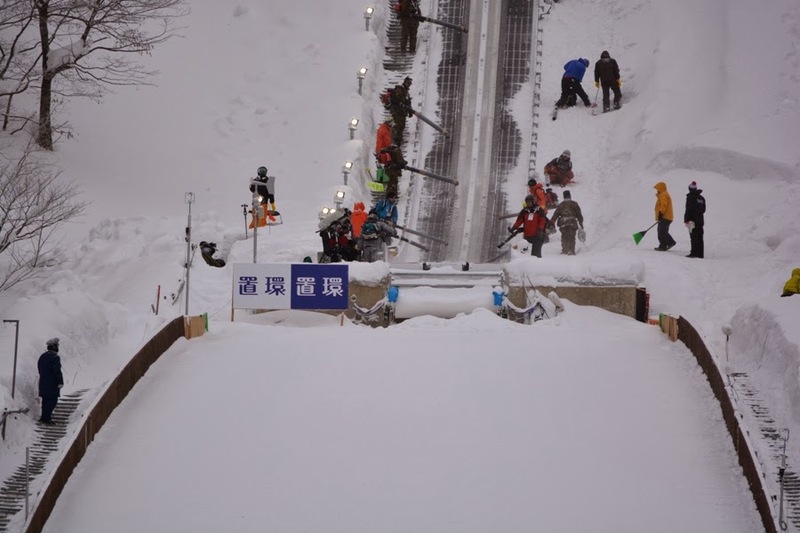 Zao ski resort area is located about 210 kilometers southeast of our home and it took us about 3.5 hours of car ride to reach the area. 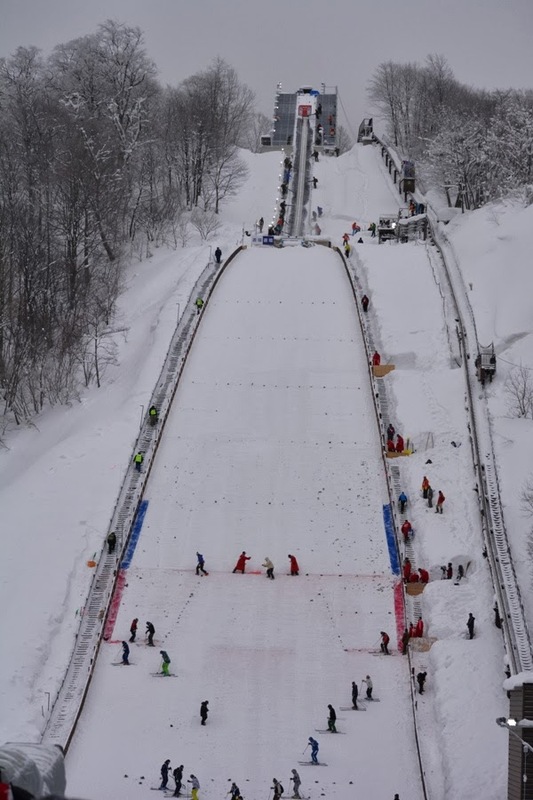 We parked our car at a car parking area and walked up to the ski jumping facility. 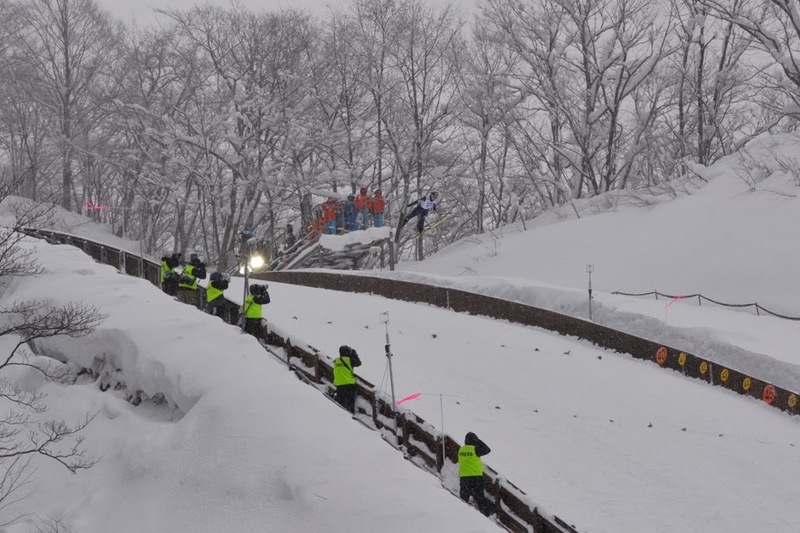 The mountainous road was very slippery and it took us almost half an hour to walk 600 meters up to the ski jumping facility. 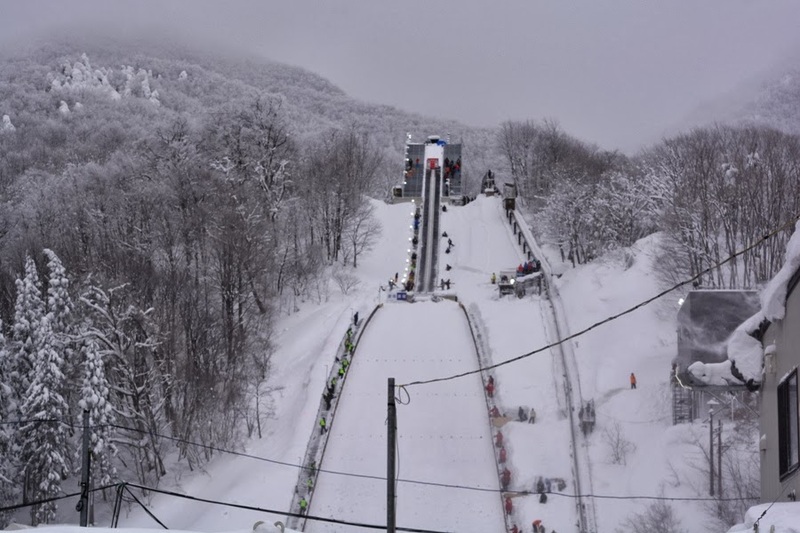 Adjacent to the ski jumping facility, we saw chair-lift to go up the mountain range for skiing. 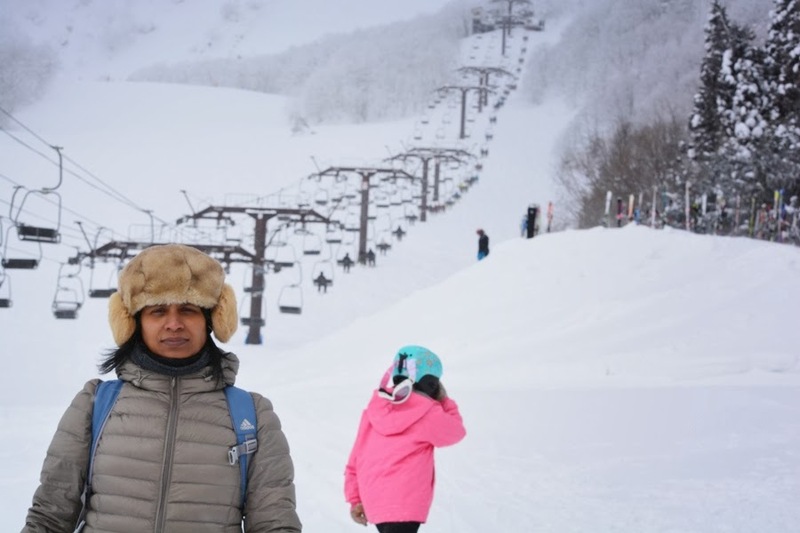 Although I wished to go up the mountain using chair-lift, I saw that no one was coming down the mountain in chair-lift as people were going up to enjoy skiing. 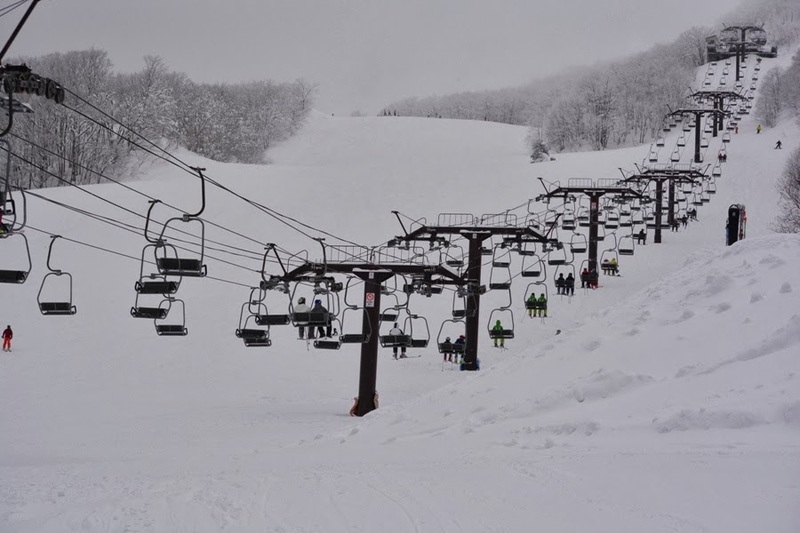 As I have absolutely no idea how to ski, I gave up using the chair-lift because I felt a bit embarrassed to come down the mountain using the lift all by myself. 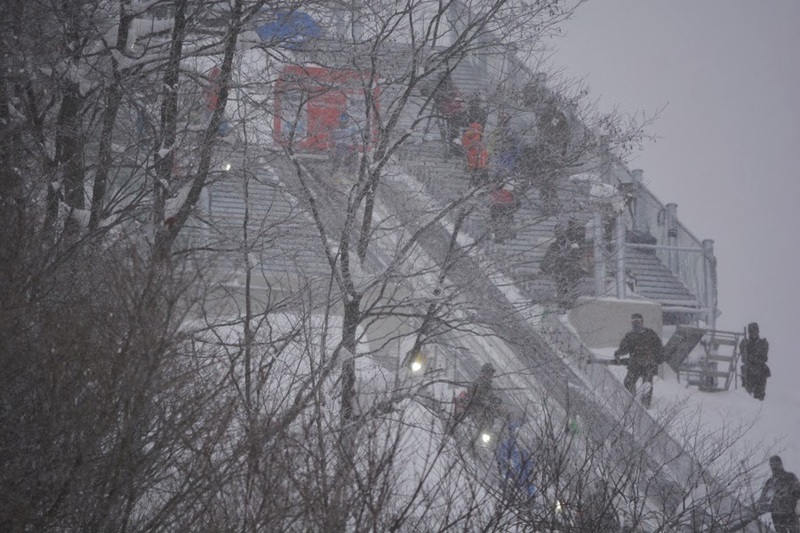 Soon we reached the ski jumping complex. I was very surprised to see the facility as I did not expect it to be so huge. 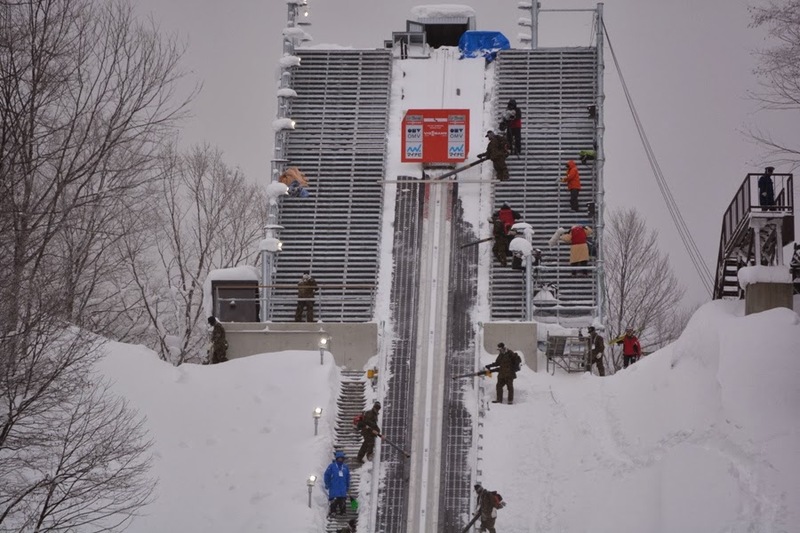 Standing right in front of the ski jumping hill, we clicked a few photos of the facility. 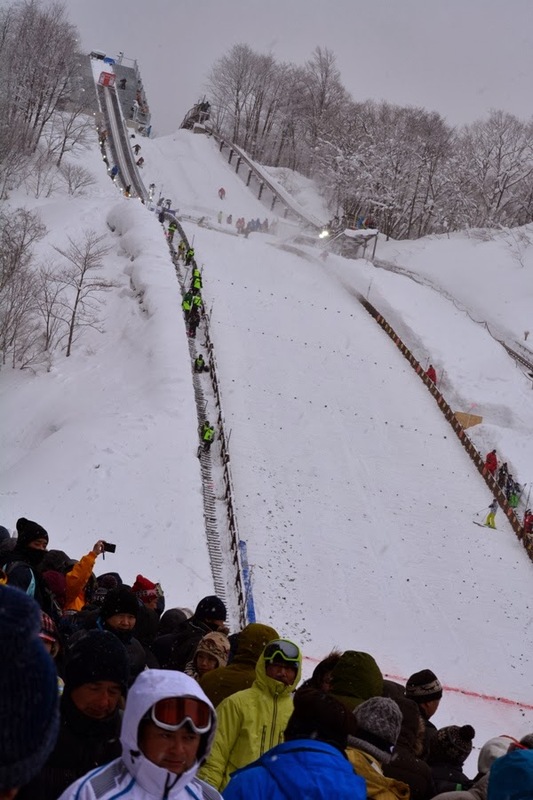 There were many visitors who had come to cheer their favorite ski jumpers, and there was almost no space to stand in front of the hill. 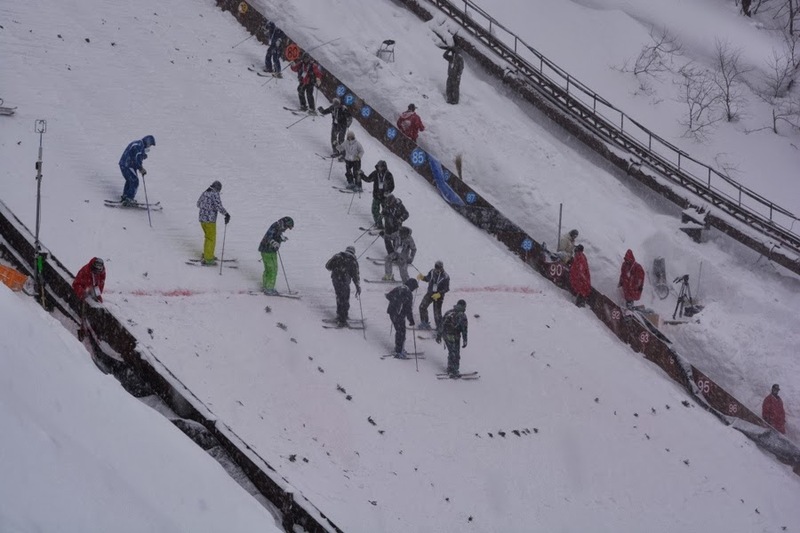 So we walked up to one side, and waited for the ski jumping tournament to start. 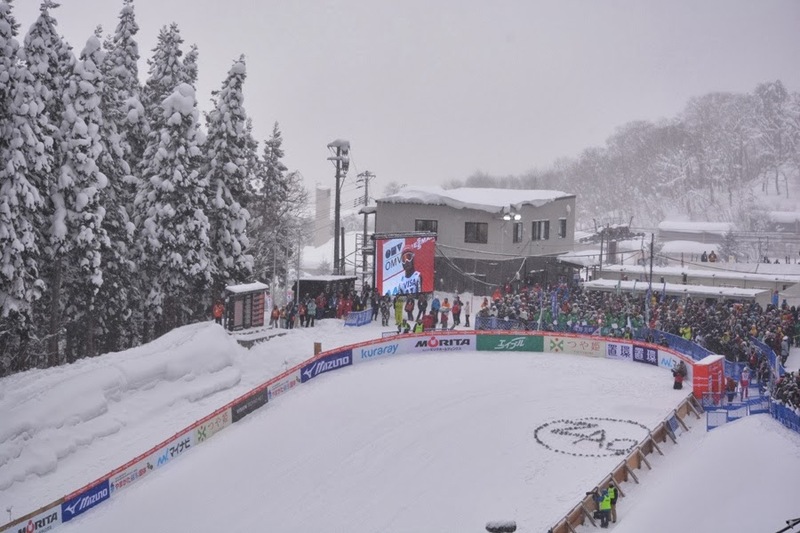 However, it started snowing heavily and the wind got stronger. 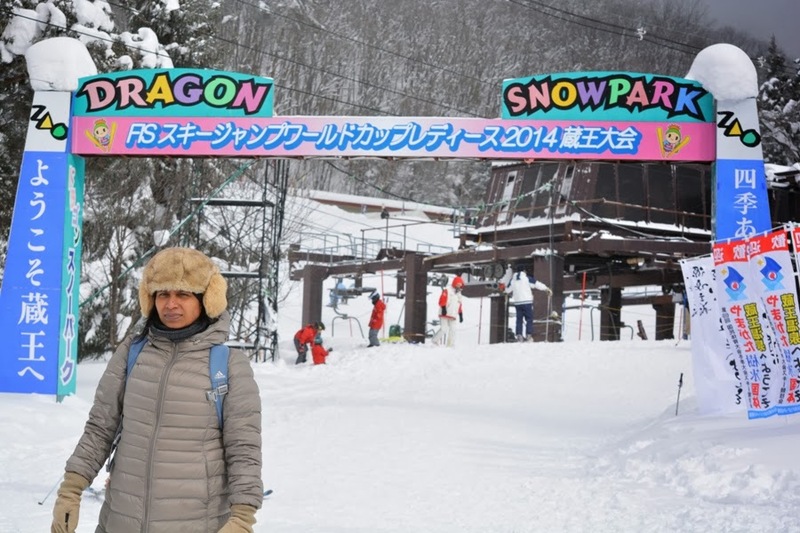 The temperature was about -8 degrees Celsius but it felt much colder due to the strong winds. 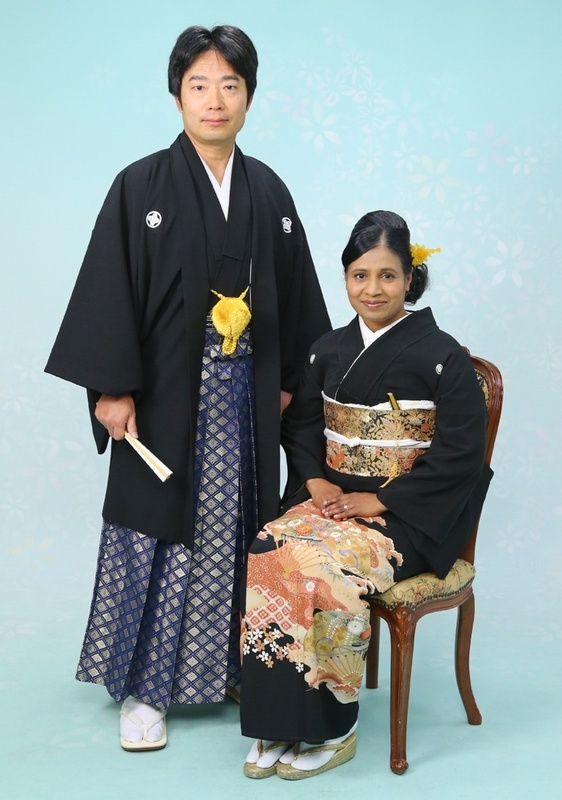 In fact, it was a bit funny to see hubby wear a cap as I have rarely seen him in cap and gloves. 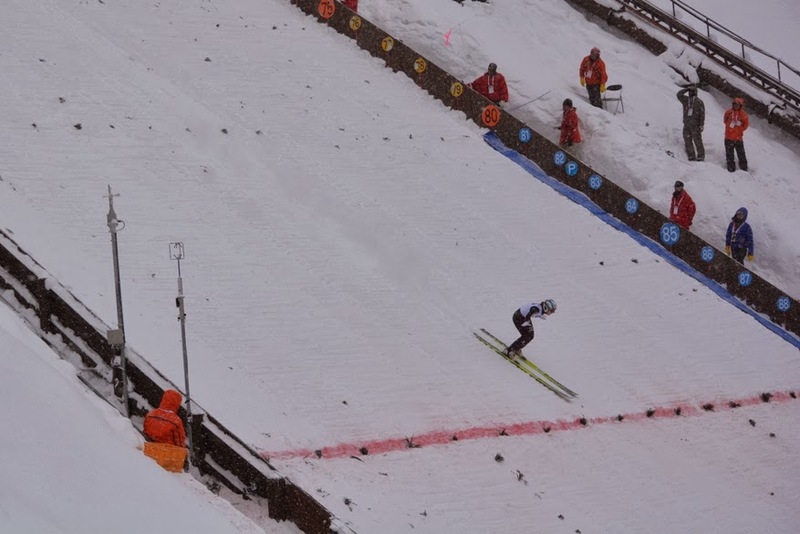 It was too cold for him too. 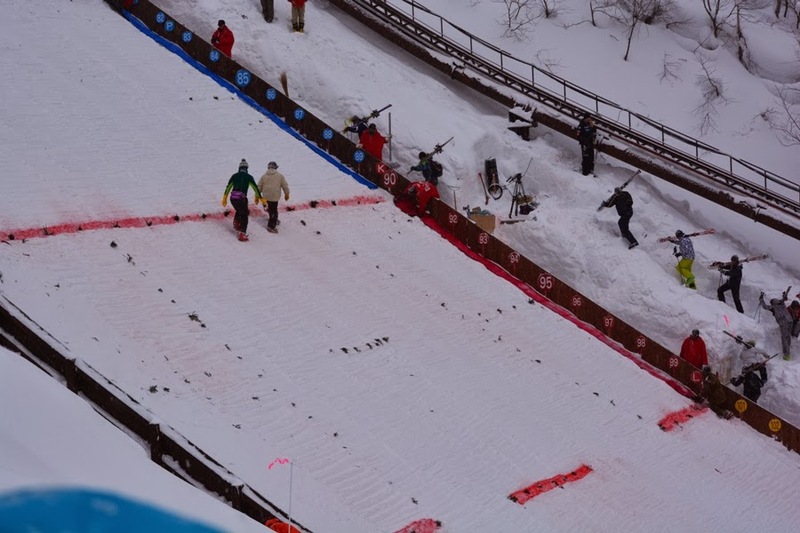 The tournament was delayed by about two hours and the staff had to continuously remove excess snow from the ski jumping facility. 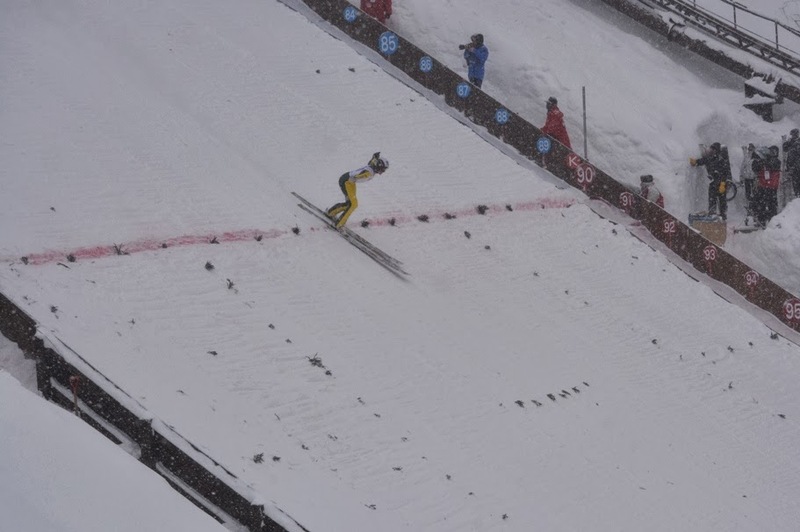 The first round of Ski Jumping World Cup Ladies Tournament started after a delay of two hours. 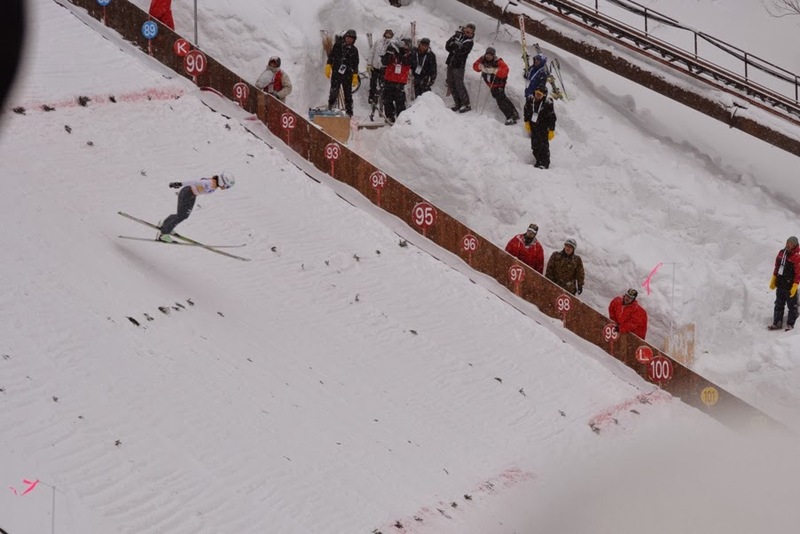 It was nice to see world-class ski jumpers participate in the tournament. 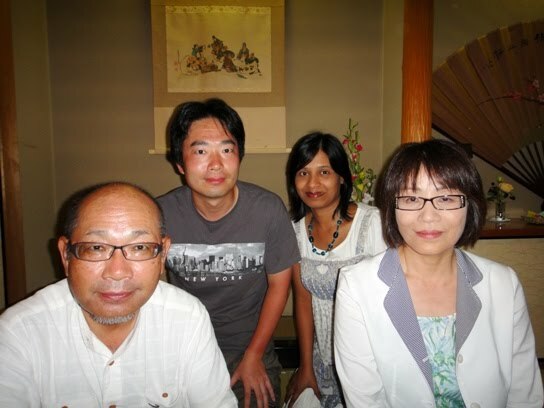 We wished to see Sara Takanashi perform and cheered her on. 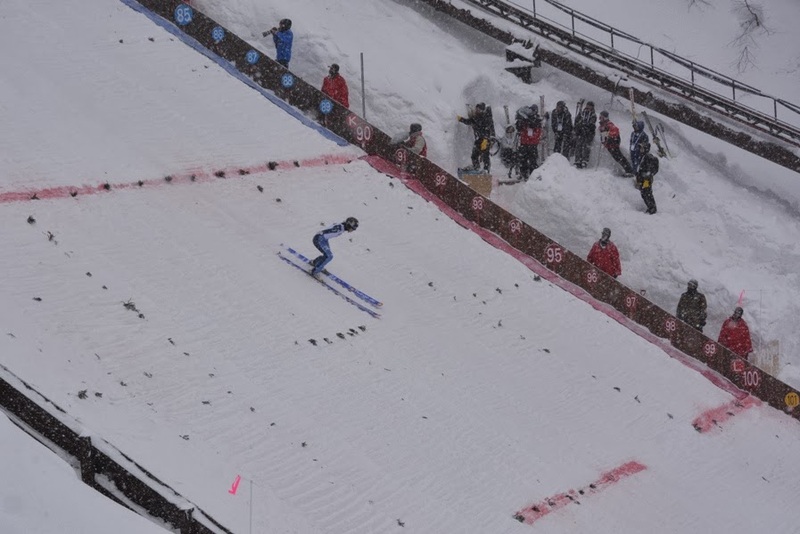 There were 41 participants from various countries around the world, and Sara Takanashi won the first round with a jump of 98 meters for 127.5 points. 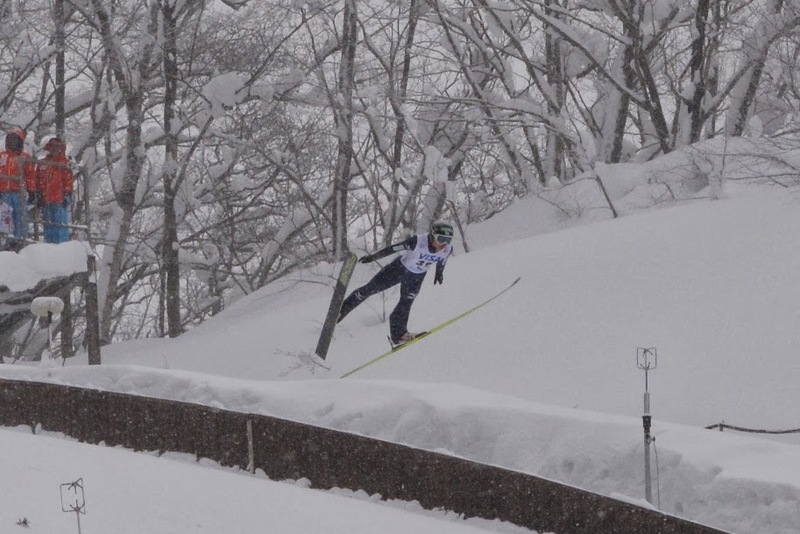 Sara Takanashi is a 17 year old Japanese teenager who made her Olympics debut at Sochi, and was placed fourth this time. 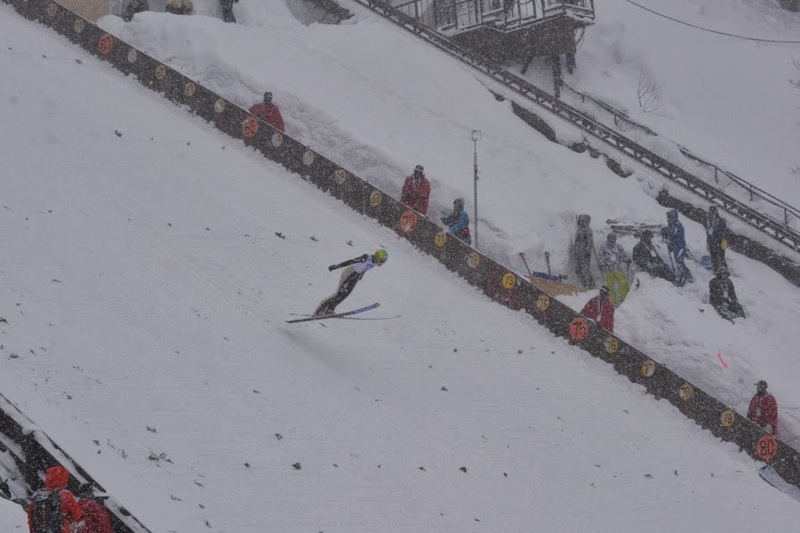 We took various photos of the ski jumpers jumping down the hill, and also compiled a video of one of the jumpers. 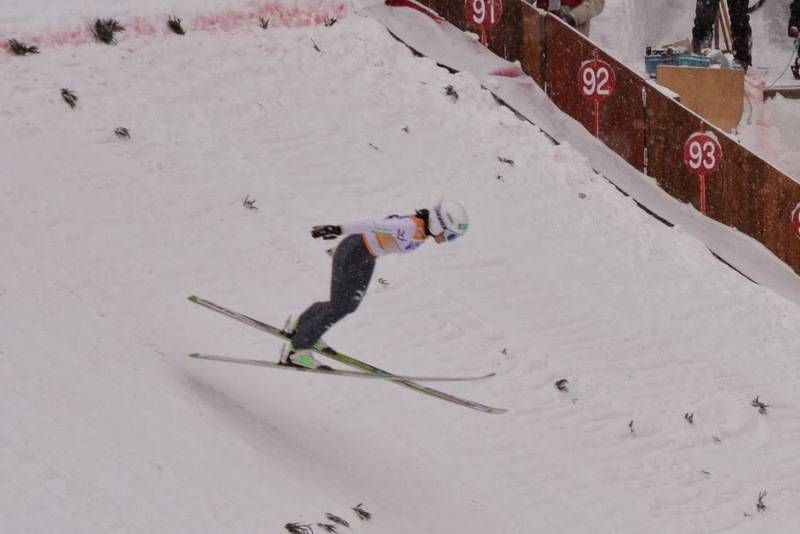 It was wonderful to watch the ski jumpers performing at their best. 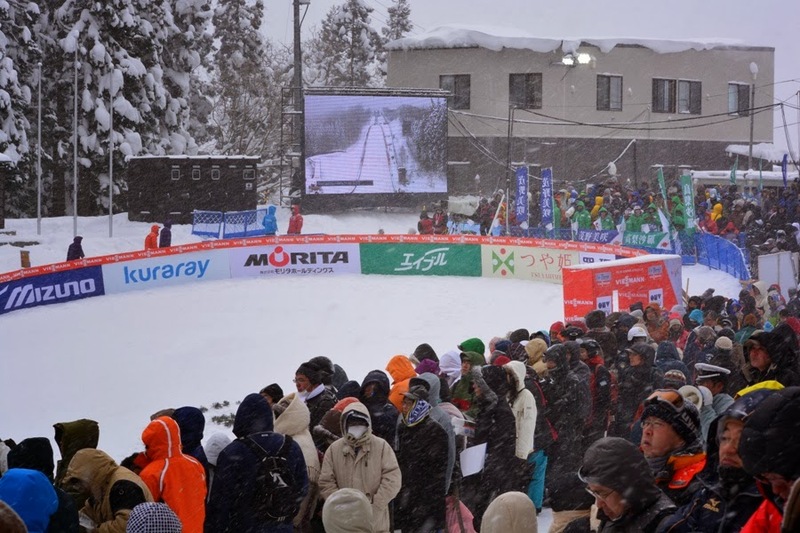 The second round of jumps was canceled due to heavy snow and strong winds, leaving the first round scores to count as final results. 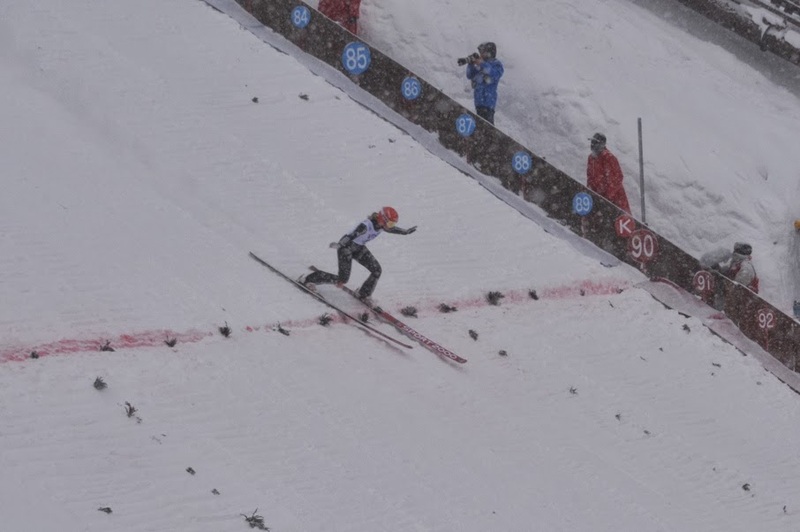 So we left the ski jumping complex soon after the first round. Afterwards, we walked back to the car parking area and felt such a great relief when we put on the heater inside the car. 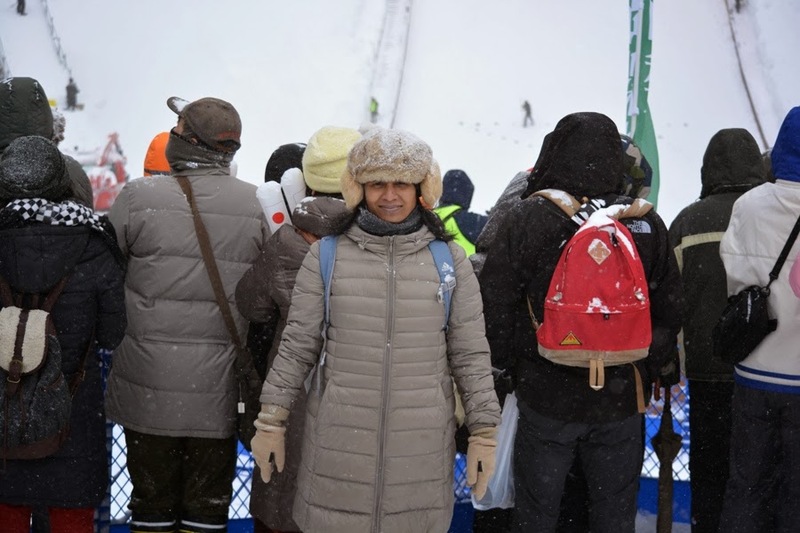 It was the first time for me to stand outside at -8 degrees Celsius for almost 4 hours but it was worthwhile as we thoroughly enjoyed the ski jumping tournament. 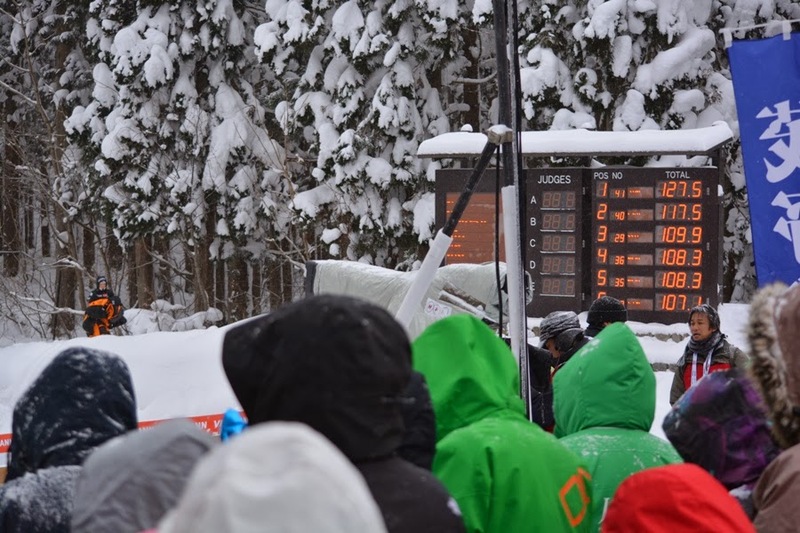 It was a fun-filled cold day for us.